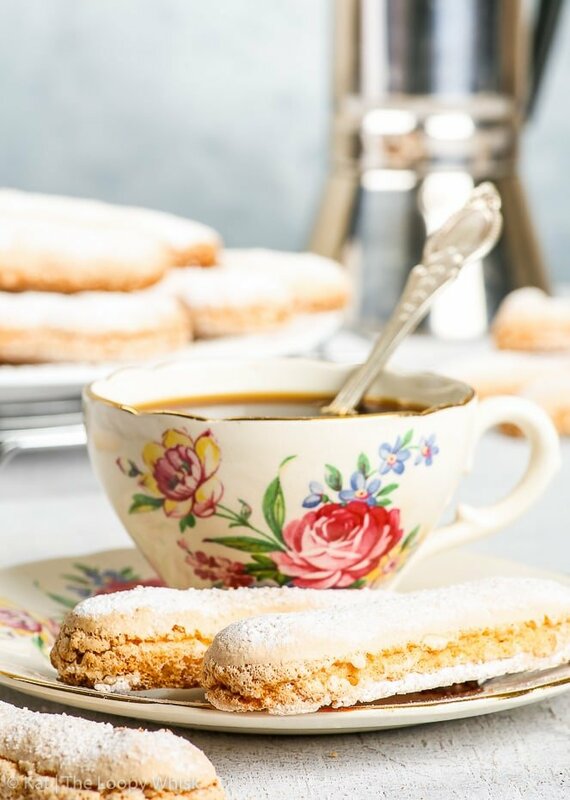 Perfect for dunking into a cup of coffee, or for making gluten free tiramisu, these gluten free ladyfingers are the cookie to have in your repertoire. Easy to make and equal (or even better) in all respects to the store-bought version, these gluten free sponge fingers will blow you away with their simplicity, taste and texture! 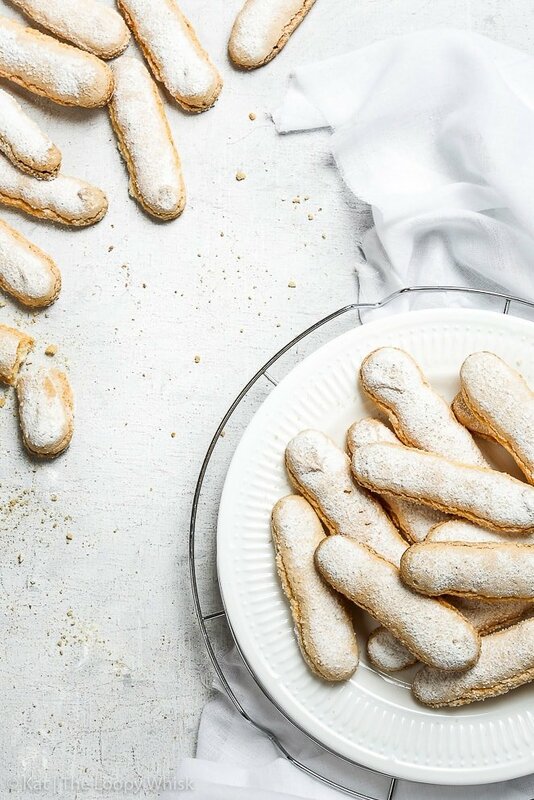 Have you ever wondered how to make gluten free ladyfingers? You know, those long sponge-like cookies you use to make the dessert of all desserts: tiramisu. Well, think again, because nobody should be deprived from the joy that is tiramisu, especially not because of something pesky like a food intolerance or allergy. And the first step to the most heavenly gluten free tiramisu? 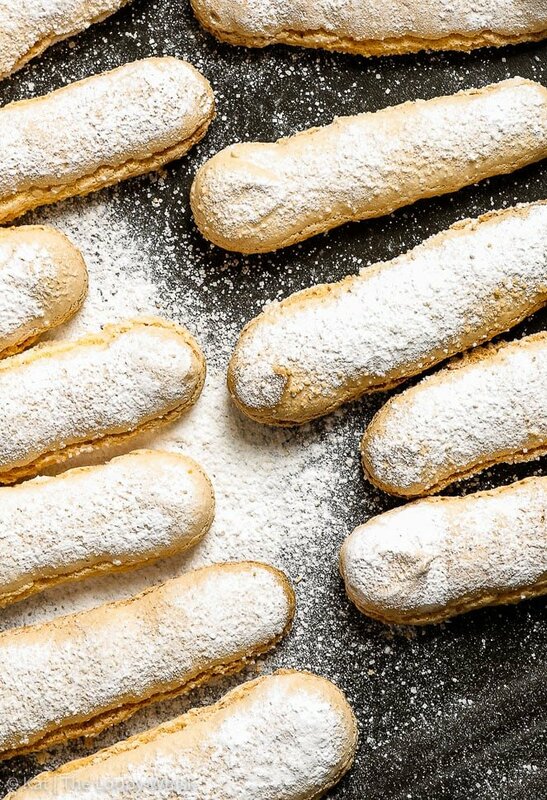 The perfect gluten free ladyfingers. To tell the truth, I was initially hesitant to attempt this recipe. 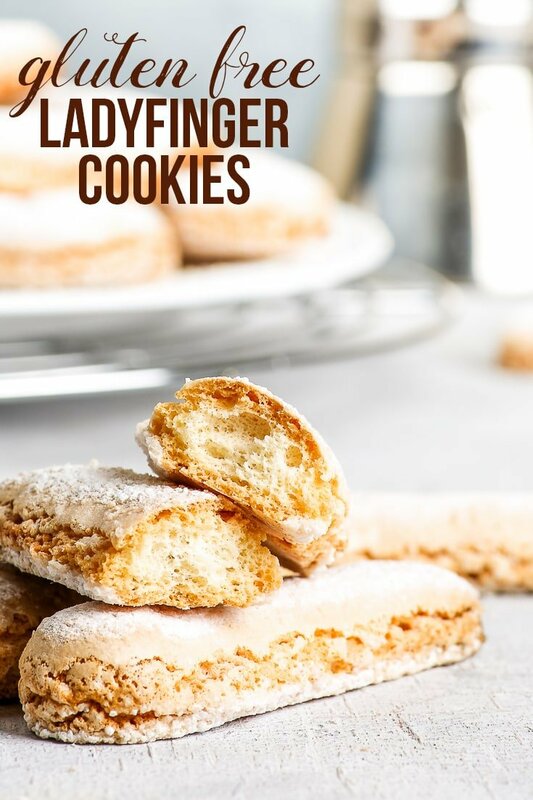 It seemed like a hassle, like nobody would be interested anyway, like it would be pretty much impossible to get anywhere near the texture and flavour of store-bought ladyfinger cookies. I couldn’t have been more wrong. It was easy, people were interested (because TIRAMISU… obviously), and the texture, flavour and appearance you get from this gluten free ladyfingers recipe are. spot. on. 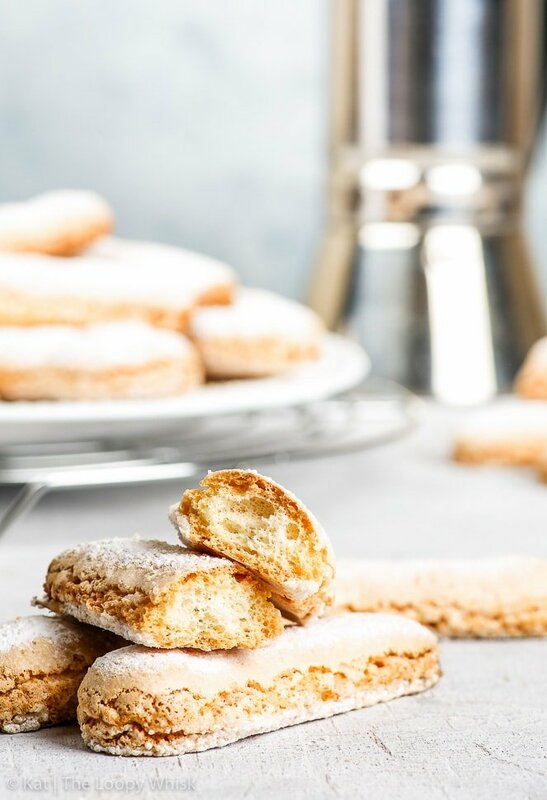 What’s more, they also have the sturdiness of a store-bought ladyfinger cookie, which makes them the perfect thing to dunk into coffee and make tiramisu with. 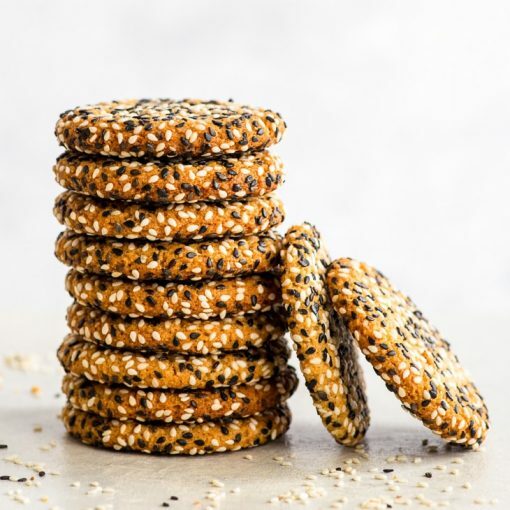 While they do get soggy in that most delightful of ways, they don’t disintegrate in your hand (like some cookies have an annoying tendency to do). We’ll need to separate the egg whites and yolks, and whip them up separately with some sugar until super duper fluffy and just plain beautiful. Yolks are then mixed into the egg whites, and a mix of flour + xanthan gum + baking powder is folded into the egg mixture. And then, all that’s left to do is to pipe the cookies (steady hands, now! 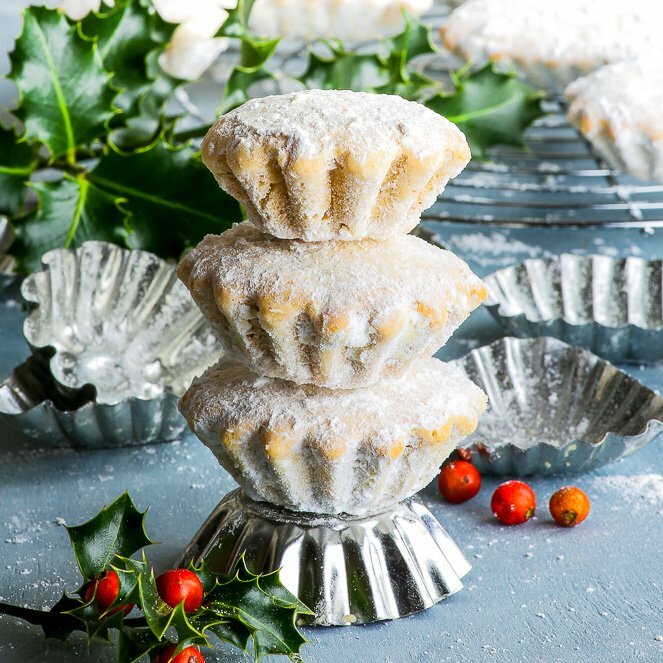 ), cover them in a layer of powdered and granulated sugar (basically making it snow in the kitchen) and… bake. In the next post, we’ll talk all about dairy and gluten free tiramisu (so excited!!! 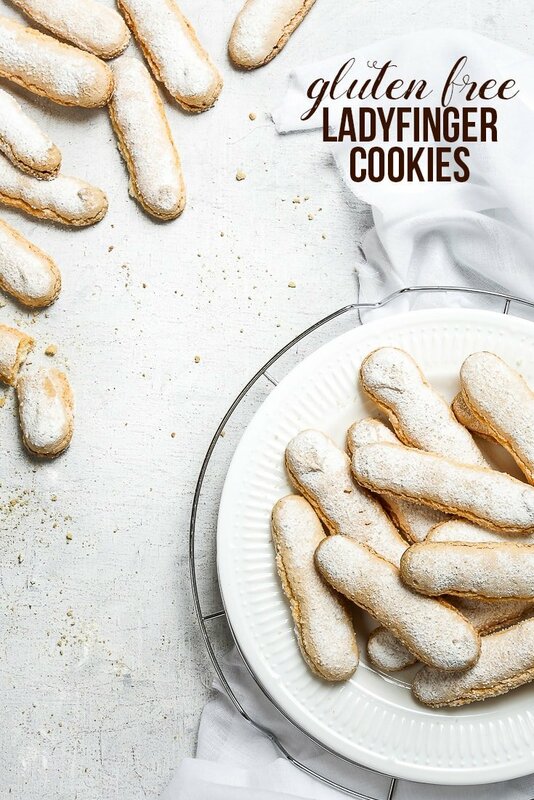 ), but for now: get practicing making these gluten free ladyfingers! 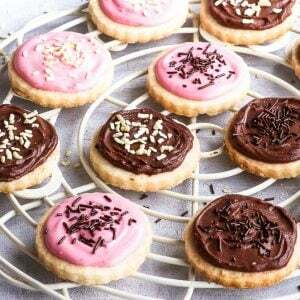 And when you’re then left with five trays of these cookies because you wanted to get the piping just right (speaking from experience here), don’t fret. 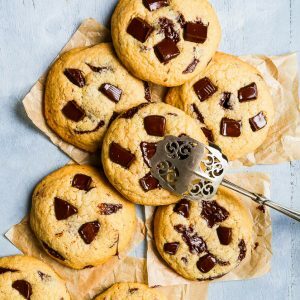 Being the very dry type of cookie, they keep very well – and they’re absolutely heavenly with a cup of coffee. After all, they’re the perfect dunking cookie. Pre-heat the oven to 355ºF (180ºC) and line two baking sheets with baking paper. 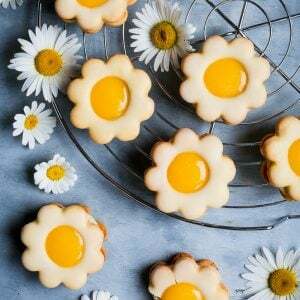 In a stand mixer, or using a hand mixer with the double beater attachment, whip 2 egg yolks and 1/2 of the granulated sugar until increased in volume, pale and fluffy. In a separate bowl, whip 3 egg whites and the other 1/2 of the granulated sugar until you get a stiff-peak meringue. Sift the gluten free flour, cornstarch, xanthan gum and baking powder into the egg mixture. Fold everything together until no flour clumps remain, but make sure not to lose too much air during mixing. 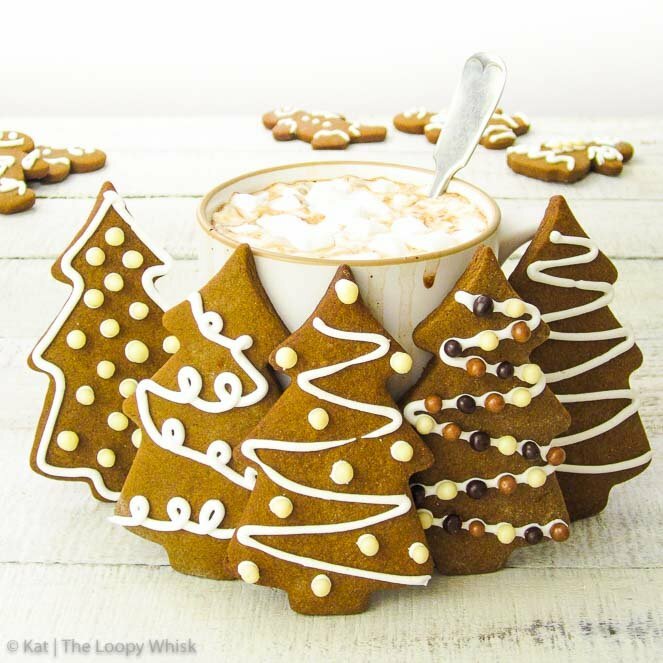 Transfer the cookie batter into a piping bag with a large round nozzle (the diameter of the nozzle will determine the thickness of your cookies, so choose appropriately depending on what size of cookies you want), and pipe about 4 inch (10 cm) long lines of batter onto the lines baking sheets. 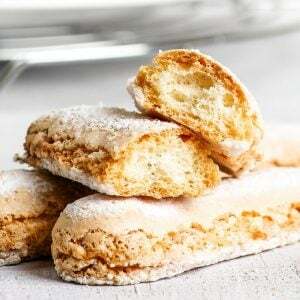 Mix together the powdered and granulated sugars and, using a sieve, generously dust the piped ladyfinger cookies. Bake in the pre-heated oven at 355ºF (180ºC) for 15 minutes, then reduce the oven temperature to 300ºF (150ºF) and bake for a further 12 - 15 minutes. The gluten free ladyfingers keep well in a closed container in a cool dry place for about 1 - 2 weeks. So excited to try this!! Store bought GF Lady fingers can be sooo expensive. Is there a gluten free flour you recommend? Hi Krystal! I honestly haven’t seen GF ladyfingers anywhere in the stores… don’t know whether that’s better or worse. 😉 I’m in the UK and I use either the Aldi “The Foodie Market” GF flour mix or Tesco’s Doves Farm plain GF flour. If you’re not in the UK, the first contains rice + potato + maize flour, the second rice + potato + maize + buckwheat + tapioca flour. So any GF flours that have a similar composition should work with no problems! Brilliant recipe! Worked first time – delicious and crispy fingers… Thank you. I’m so glad you liked the ladyfingers, Chris! Is there anything would be a good replacement for cornstarch? I’m trying to make it corn-free too. Hi Emmalee! Arrowroot starch or tapioca starch should work perfectly fine. I’m having a difficult time understanding the measurements. How could a 1/2 a cup of powdered sugar be 65 gms but a half a cup of granulated sugar be 100 gms? I found the measurements a little confusing but figured it out. Made these today and they turned out perfect. Thanks for sharing! Could I pipe this into a cake instead of cookie shapes? 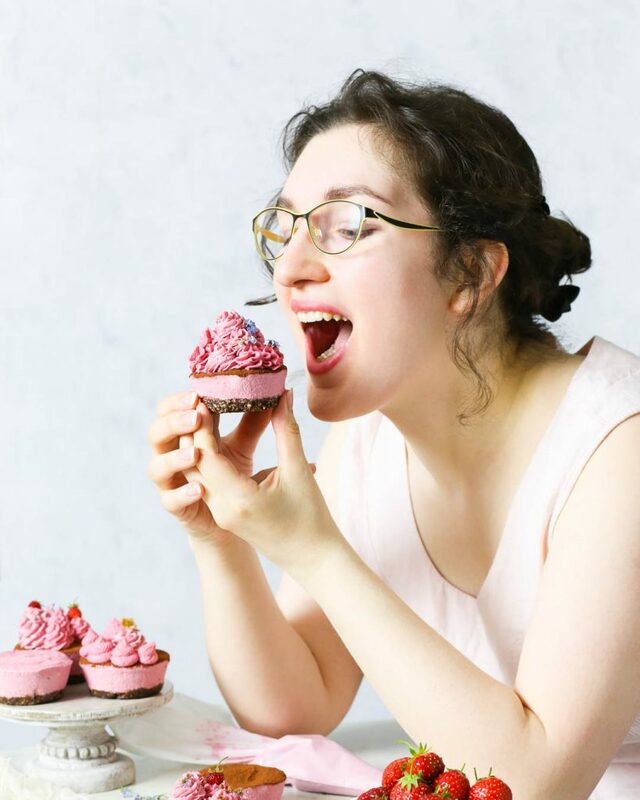 could almond flour be substituted for the GF flour? If you haven’t tried this already, almond flour is very heavy. you could use it to substitute up to half of the flour, but you would want something lighter, such as rice or sorghum flour, and maybe extra cornstarch or tapioca starch to make up the remainder. It will probably still work okay, but the cookies likely won’t rise as high, and will be a bit chewier. If my GF flour already has xanthan gum in it, could I omit adding more? Yes, if your blend contains xanthan gum, you don’t need to add extra. Hi Daniel! If you can’t get xanthan gum, it’s not a big problem, it won’t make a huge difference in this particular case. 🙂 Just omit it from the recipe. 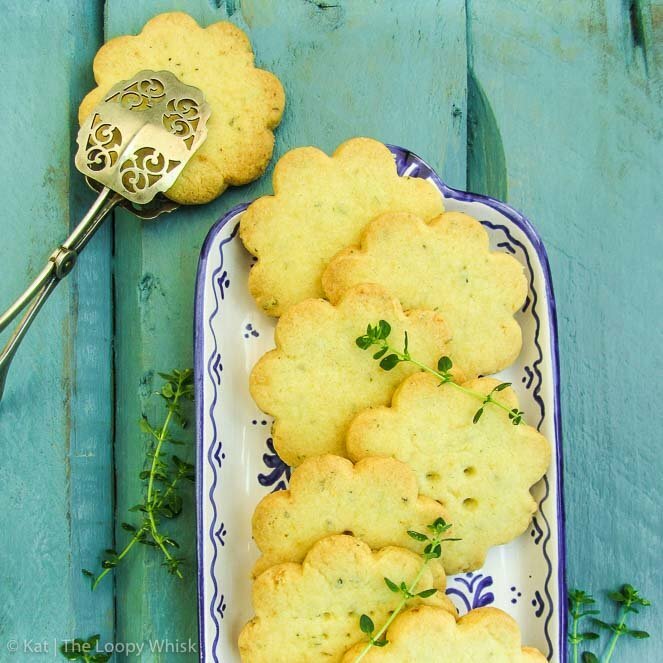 Very excited to try this recipe, I have wanted to make a gluten free lady finger for years! Due to medical reasons I am unable to have much sugar. Would the recipe be compromised if I decreased the amount of sugar used? Thank you for your help! I think the recipe should work with a smaller amount of sugar, but the texture might be slightly different (maybe less crisp). Glad you enjoyed the recipe, Bozena! I was a bit intimidated by this recipe as I’m not much of a baker but I just made them and they’ve turned out perfectly – thank you so much for a great recipe! I used the whisk attachment of my hand blender and that seemed to do the job and I left out the xanthan gum. I’m interested to know if you could use the third egg yolk? I hated throwing it away!